1. I understand that the 1:72 Mirage kit of the AH-64 Apache which was first mentioned in HKN #80 will released in Poland in the next few days. At the time this kit was first announced in FineScale Modeler there were to be three different versions, a US Army AH-64A, a Netherlands AH-64D, and a UK WAH-64D. It now seems there may be an Israeli version as well. This kit is unlikely to be a serious challenger to the various excellent Apache kits already on the market; I'm told that in comparison with one of the best, the Academy kit #2138, the detail is rather less sharp and the decals are unimpressive. 2. Twobobs Decals #48-005, AH-1S Foreign User Cobras (markings for three complete helicopters, Pakistani, Jordanian, and JGSDF markings) will be shipping in about three weeks. 3. David Campbell's Hoverlover's Model Page has pictures of some excellent looking models. 4. Since there's not much news and the subject has been raised on the rec.models.scale newsgroup this week, here's a slightly revised version of my review of the 1:72 Aircraft in Miniature / Transport Wings Sikorsky S-61N Conversion, #TWC-007 which originally appeared in Pete Harlem's now almost entirely defunct Rotorwash e-zine in about September 1997. This resin, vac-form, and white metal conversion kit was released in February 1997, and intended for use with the venerable Airfix / MPM Sea King, though the excellent Revell kit #4427 might now be preferred. A: Two pre-cut fuselage halves formed in thick (1.5 mm), dark green plastic, which are intended to completely replace the kit fuselage. Although these are pre-cut, they still need some rubbing down to remove the lip around the edge. You need to cut out the scrap plastic from the cockpit and the front of the engines. The most striking feature, apart from the prominent rows of pimples which need to be rubbed off, is the absence of any guidance for the position of window and door openings. The windows are supplied as black decals as per airliner models, though few helicopter modellers are likely to be satisfied by this expedient in this scale. Cutting out the windows is going to be a major exercise; but at least you can use a photocopy of the decal sheet as a template. The representation of the boat-shaped prow of the fuselage is rather poor, the edges being far too rounded, but some filler and sanding down along the edges should put this right. Probably a far more satisfactory alternative would be to cut off the whole nose section behind the canopy opening, and use the nose from the original kit instead, at least this way you've got some chance of the kit clear parts fitting reasonably well. Extending this line of thought even further, the section between the tail fold and the exhaust could also be replaced with parts cut from the original kit, as could the engine housing, by which time you might begin to wonder why you bought the conversion set at all ! B: Two resin moulded sponsons. These were originally going to be vac-formed plastic, but for some reason they were unable to get satisfactory mouldings by this method, and resorted to resin instead, which was one of the reasons why the kit came out about four months after it was first advertised. The sponson shape is about right in general terms, although the edges could do to be sharper and they fail to capture adequately the slightly concave appearance of the under surface. A little judicious use of putty or filler and some careful sanding should improve their appearance. Flotation bag bulges are moulded on. I seem to recall having heard that these parts may be available separately for use with other Sea King versions which had the larger sponsons, for example the Danish S-61A-1 whose decals are supplied in one of the Fujimi Sea King kits. C: Two white metal Z-braces for attaching the sponsons to the fuselage. D: Four straight braces, as above. The way these are arranged in the instructions bears no resemblance to real life, so some good reference photos should be used to get this right. E: Two aerofoil section main sponson braces. One is about 2 mm longer than the other, so some adjustment is going to be needed somewhere along the line. F: Two solid cones representing the particle separators / intake filters. G: Nose radome. A few extras of this would be very useful additions to the spares box, so make a note to construct a mould from this part before using it. H: Locator antenna for right side of fuselage. J: ADF antenna for right underside of fuselage. K: Decca Navigator antenna for left lower fuselage. L: Increased span stabilizer, nice bit of moulding this. The remaining parts are intended to come from the kit, including cabin interior, wheels, rotors, and the tail/pylon section, thus ignoring the fact that the S-61N rear rotor pylon differs in shape from that of a regular Sea King. The pylon on the S-61 rises more vertically from the tail boom, is higher, and is narrower from front to back. This oversight is possibly the most serious drawback of this conversion, and will be troublesome to overcome. The dual pitot tube assembly which protrudes from the main rotor head is left entirely to the modeller's own ingenuity. 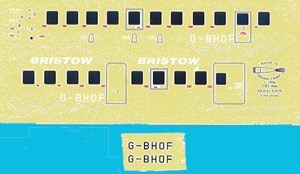 Painting instructions are good, and the decals for Bristow Helicopters G-BHOF look to be fairly comprehensive, with the proviso that if you don't use the black windows they're going to need a lot of hacking up to separate the windows from the other detail supplied for each side. The registration letters printed in white on the main decal sheet are a mistake. They need to be replaced with the black ones supplied as an afterthought. The decals also include the zig-zag rope attached to each side of the lower fuselage, which many modellers will want to represent with stretched sprue or similar. All in all, this conversion set is a well-meaning effort which falls somewhat short of the mark, but this shouldn't deter the determined modeller, and the potential is there for a fine looking result. 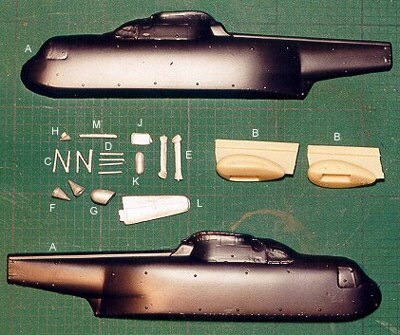 Aircraft in Miniature also sell a conversion to make the S-61L, which will lack the resin sponsons. This is #TWC009, was released in about May '98, and comes with decals for New York Airways. Going back in time more than 25 years, comprehensive detail and painting instructions for an old British European Airways S-61N, G-AWFX, were included in an article by Alan Laird in the Airfix Magazine of September 1971 which showed how to convert the Airfix Sea King using entirely scratch-built methods. For the really dedicated only, this included such gems as building up the canopy with individual panes of perspex bent to shape to replace the rather bulbous kit part, and sponsons 'moulded in plastic card in the usual way'. This article recognises the tail-rotor pylon problem, which it solves by removing all but the base and the tip and replacing the centre section with laminated plastic card. Also included were good suggestions for how to achieve the non-rotating pitot tube assembly while retaining a rotating rotor, and various interior seating layouts.